Our Business Partners have created their own solid and secure route of earnings for themselves over time. This article is for you if you would like to earn some extra income through referrals. 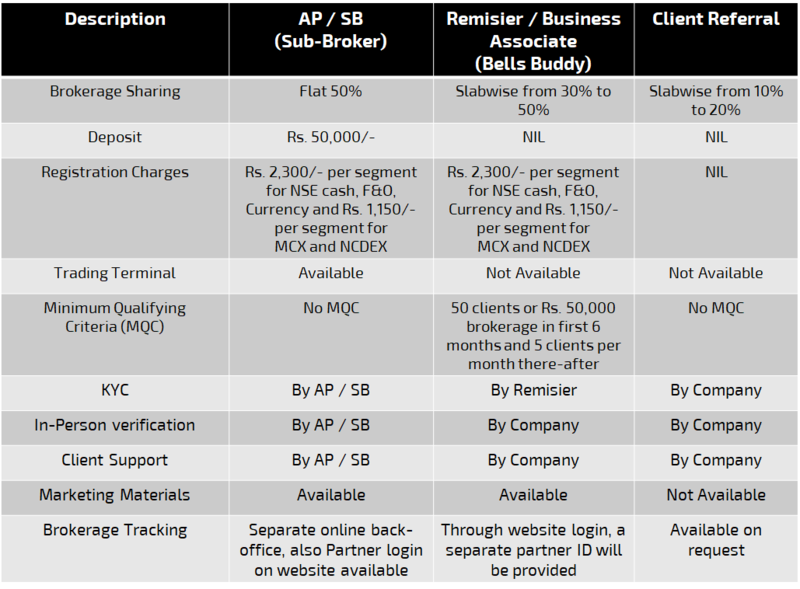 AP / SB: An Authorised person or Sub-broker is registered with the exchange and can act on behalf of the broker. Client Referral: You may also enjoy sharing in brokerage by referring clients to us without the need for any registration. All you need to do here is refer your friends to us and we will reward you with a share in the brokerage they generate. Most of our clients start by referring clients (Option #3 above) and enjoy 10%-20% referral brokerage. Those who are able to provide higher number of referrals, then opt for the Remisier Plan (Option #2 above). Here they enjoy higher brokerage sharing (upto 50%) against a nominal monthly commitment of 5 accounts. See below comparison chart for the detailed benefits and conditions under each of these three partnerships. If you would like to discuss about partnering with TradingBells, please reach out to us on helpdesk@tradingbells.com or 022-33756300 and we shall be glad to assist you.